When it comes to hair styling, I usually opt for a more texturised look. Perhaps it’s because hair styling takes such a long time and it’s quicker to pull off a messy hair look but every now and then I will make the effort and reach for my shiny hair products for a lovely glossy finish. Before I started blogging I was always a bit scared to put products into my hair after washing. I think in particular with shiny hair products the amount you use can either make or break your look but I feel like I’ve finally found a great mix of lightweight shine products which should be safe to use, even if you go a little heavy handed with them. Serum type products are the ones I usually avoid but I’ve been loving the John Frieda Liquid Shine Perfecting Glosser*. It’s from the Brilliant Brunette range which you all know I love but it does come out clear so I’d imagine other hair shades would be fine to use it on. You simply take a small amount depending on the length of your hair, smooth it all over soaking wet hair and it gives a lovely smooth finish to the ends and makes the hair look really shiny and healthy looking. I don’t find it weighs my hair down or makes it feel too heavy so I’d highly recommend it. Also from John Frieda is the Full Repair Oil Elixir* which is a very lightweight oil. I’ve used all the different kinds of moroccan and argan oils but I have to say this one’s probably the safest one to apply. It does suggest one pump only but I find I can get away with about 3 or 4 pumps. Also great to smooth over dry hair as it’s quite a dry oil which gives the loveliest shiny finish. Every now and then if my hair is looking a little dry, I’ll pop one of the V05 Hot Oil Treatments into my hair. These have been around for a long time in all different forms but I prefer the little individual bottles for each application. I find it repairs all the flyaways and frizzyness which helps all of the other products work much better. 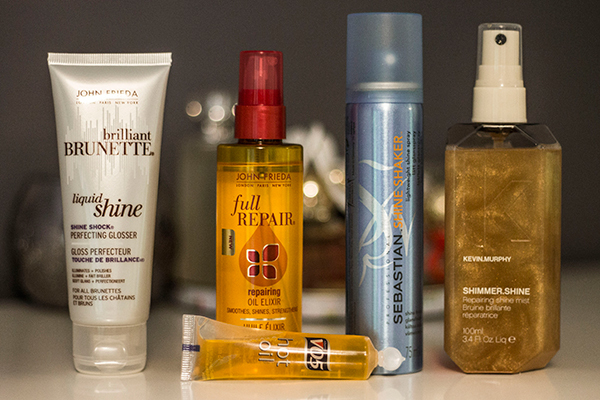 If oils and serums aren’t your thing, I’ve thrown in a few of my favourite shine sprays. First up is the Sebastian Shine Shaker* which is a really fine, lightweight spray so it’s perfect for first time users. I think the spray nozzle is one of the best features as it covers a large area rather than focusing the product on a single area so it’s really easy to spray on. I find it takes a few sprays for a shiny finish but if you’d rather have a smooth finish I think a quick spray all around the hair instantly smooths out your hair and makes it really soft to touch. Last but not least is probably one of the most gorgeous bottles I’ve ever seen with the Kevin Murphy Shimmer Shine* spray. When it’s sitting still it looks like a normal spray but when you shake it up the golden glitter particles rise up and blend with the formula, hours of amusement on that alone. Unlike the Sebastian spray, this focuses more on one section of the hair rather an an aerosol spray so it’s great if you’d rather focus on each section and go around the hair or if you have shorter hair. You can actually see the little glitter particles catch the light in a subtle way so don’t worry you won’t have a disco ball head! If you’re going on a night out you can also use it on your skin for a lovely glow. Smells amazing (an amber/woody scent), looks amazing, does the job. As always feel free to leave your suggestions for other shine sprays and if you’ve ever tried any of these ones.